Flying gives me the opportunity to see things I would normally never have seen or to see things from a different perspective. I love to find something new while flying, then doing some research once I land to learn more about what I saw. Almost exactly a year ago I discovered a neat looking building on a river near Cincinnati, OH. I later learned it was a Civil War munitions factory. I was so interested I then visited it by foot and enjoyed snapping some photos of the historic building. This past weekend I had the opportunity to view a shipwreck while flying over the Door County Peninsula. When I landed, I was curious to learn more about this ship that now rests in the shallow water by the shores of Lake Michigan. So I sent an e-mail to the Door County Maritime Museum. They directed me to Jon Paul VanHarpen of Lake Nautical Affairs who quickly replied with some information about the ship. 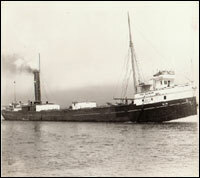 According to Jon the wreck is "that of the City of Glasgow built in 1891 and called one of 'the big four' the four largest ships on the Great Lakes(297 feet in length), she was destroyed by fire Dec. 7 1907. She was rebuilt to a barge of 195 feet in length in 1911." In 1917 the City of Glasgow ran aground off the Lake Michigan shore of the Door County Peninsula and was abandoned. I came across a website that has some interesting photographs of the wreckage. The site says the following of the current state of the sunken wooden steamship, "Over the years, due to water and ice, the top of the ship has been sheered off, exposing the deck substructure just below the surface." In addition to viewing photos you can see some underwater video footage on the WisconsinShipWrecks.org website. Lastly, Keith Meverden of the Wisconsin Historical Society pointed me to some great details and photos of the City of Glasgow. FYI, clicking the picture on the right of the page, I get unrendered text. I'm not sure why that is. I'm using Firefox on W2k.